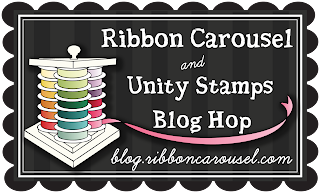 Danielle Daws: Blog Hop with Unity and the Ribbon Carousel! 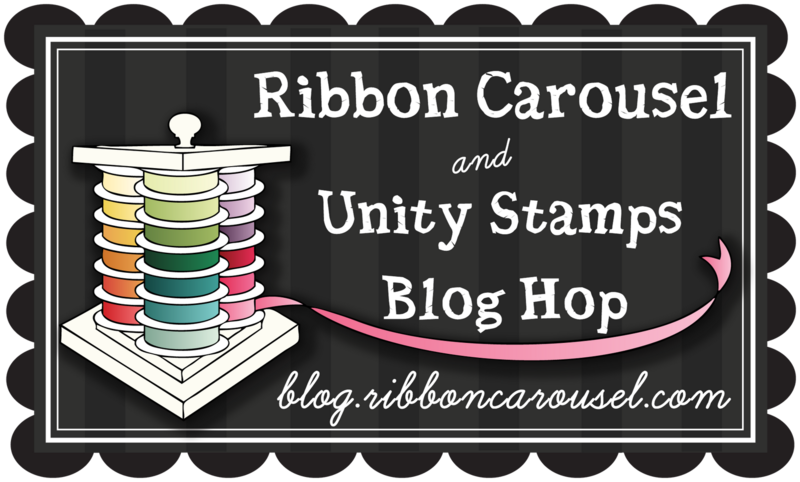 The Ribbon Carousel is teaming up with Unity Stamps for a fabulous Blog Hop! 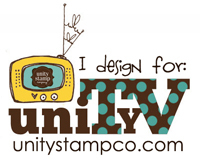 I used the super cute Unity Stamps Life's Short...Eat Cake! set for my card. I black embossed the sentiment on watercolour paper and coloured it with Peeled Paint Distress Ink. When it was dry I coated it with Glossy Accents. The background was done by stamp-a-ma-jig-ing the month stamp from Life's Short...Eat Cake! using Versamark. From the Ribbon Carousel, I used Bazzill Card Shoppe cardstock in Peanut Cluster, Banana Split and Licorice Twist, and some 3/8"Grosgrain Horizontal Lines Ribbon in Orange/Yellow and Red/Orange. You want to know about the prizes, right? The Ribbon Carousel are giving away a ribbon carousel to one lucky blog hop participant! 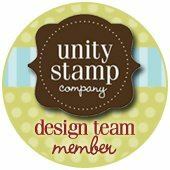 AND Unity Stamps are giving away a whopping TEN itty bitty stamps (winner's choice) !! Just make sure you hop and leave some blog love along your way to be eligible for the prizes! Love the design and bright colors!! So fun! Great design. Love the ribbon for the sun's rays and also how you did the sentiment! i LOVE this card!! Love how you used the ribbons as the sun's rays! amazing. REALLY like the months stamp used as a background on the sun. And of course the ribbon is fantastic! This is so great! Love the ribbon sun rays! Love the sun rays! Great card! So adorable! Love the use of ribbon for the sun rays! Great card, The ribbons make it pop. Great ribbon and I love how you have used it. the orange & red ribbon is really cute, love how you alternated between them! Oh I love this! That is some FABULOUS ribbon!! Wonderful card! Love the sunshine! Love the lay-out of this card and the bright colours. Thank you for sharing! Love this Card! I especially love how you used the ribbon! Fabulous card! Love the glossy accents and ribbon! What a cheerful card! That glossy accents add so much to the fun! 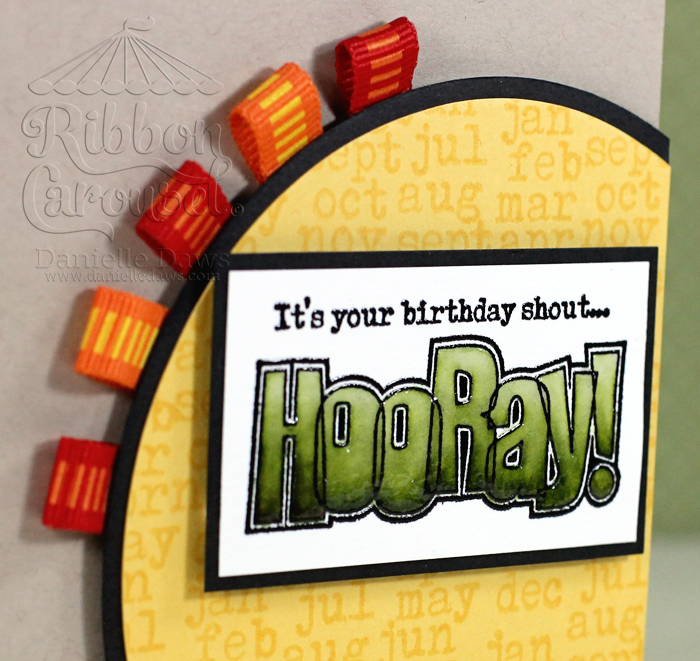 Fun card and great use of ribbon scraps! Love your card. Love the bright fun ribbon too. Awesome project! Love the ribbons around your circle and the sentiment you used. Adorable and wonderful use of the sketch!! Beautiful project. Great way to display ribbon. Absolutely amazing - as always!!! Thank you so much for using this week's RetroSketch! beautiful card--love the ribbon tucked in. love the folded ribbon peeking out. Also I was so inspired by your craft space! It was impressive, thanks for taking the time to post all those inspiring organizational photos! Too cute ...I love how you used the ribbon for the rays of the sun. very creative. TFS. Love your ribbon tabs. very cute. How cute!! Thanks for listing all the supplies, I love your ribbon loops, it's a great idea and you can use all your scraps. This is absolutely darling! Love how you tucked the ribbon behind your circle. Cute card! Love how you added the ribbon! Love the layout of this card and the colors are so vibrant. I think the ribbon really makes the card. I love how you added the ribbon! Awesome! Wow! Amazing colors! Great card. Great card. Like how you incorporated the ribbon and colored the sentiment. Gorgeous colours Danielle! Love the 'Hooray', supa funky font! Wow, Great design. I love the little ribbon tabs. Love the colored hooray & the ribbon colors are so vibrant!Very cute!! The Ribbon Carousel and Unity Stamps are a dynamic duo. Thanks for this fun blog hop, all your hard work, and a chance to win. I appreciate the opportunity. 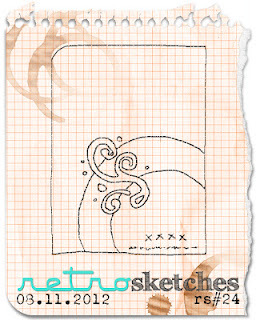 Great sketch and love how you incorporated the ribbon! I love the colors and design on your card! Wow!! Love your card! Great process of embossing, watercoloring and glossing! Fun way to use the ribbon. Thanks for the great chance to win! Love blog hops! Love those ribbon tags :) Great card! Love, love, love how you did the ribbon tabs!!! That's too darned cute! Danielle, your card is wonderful. Love the craft background. Your stamping, coloring, and glossy accents are amazing. Fabulous grosgrain ribbon, too. What a fun colorful card! Love the coloring on the word stamp! I love love love the use of the ribbon here... and I love the ribbon itself! Fabulous card! Love your card! Great color combo! Very fun!